Something we get asked about a lot is bringing Charlie, our dog, on our road trips. Like us, Charlie is happiest when he's off-leash, romping around somewhere amazing, ideally with a water source nearby. He is just a different dog when he's on the road with us, we even have the nickname Road Charlie and use it often! Before I get started, I must preface this by saying that every dog is different. What works for us might not work for you and the only way to truly make your dog a Road Dog is to just bring them along and figure it out along the way. We live in south east Texas, so our first day of a trip is almost always 12 hours or more of driving. While we humans can rest up the night before and mentally prepare ourselves for the endless miles of Texas nothingness, Charlie has no clue what is coming when we pack up the car and head West. Here are some key ways you can set your pup up for success on these long days! Always try to take him on a long walk before getting in the car. Bonus points if you can go to an off-leash area and let him really run around. Make sure his spot in the car is a comfortable place to lie down and that he has room to move around/adjust. Try to stop at parks instead of gas stations when possible. We love stopping at rivers because we can let him off leash to potty and drink water. Eat your meals outside! If you bring food, you can stop at a park, creek, or river and let your pup run around while you eat. If you buy food, try to eat outside so he isn't waiting in the car. Try to feed him at his normal time. If you're driving until 2am, don't make him wait until you set camp to eat! The most important thing is that you think about his needs throughout the day. Routinely check on your dog and see if they seem comfortable or stressed. Charlie has become pretty good at communicating when he needs to potty or when he's hungry, but hydration continues to be our biggest challenge and focus with him. Most dogs have access to water at home whenever they need it, so having to drink water from their bowl at a gas station can be a huge adjustment. Sometimes we know he needs water but he won't drink, and we've learned we have to be patient with him. I must say, always be aware of the wildlife in your area! Mountain lions and coyotes are legitimate dangers for dogs, so keep an eye out and don't let your pup wander too far. Charlie always gets a little nervous and, lucky for us, stays super close when we hear coyotes in the distance. 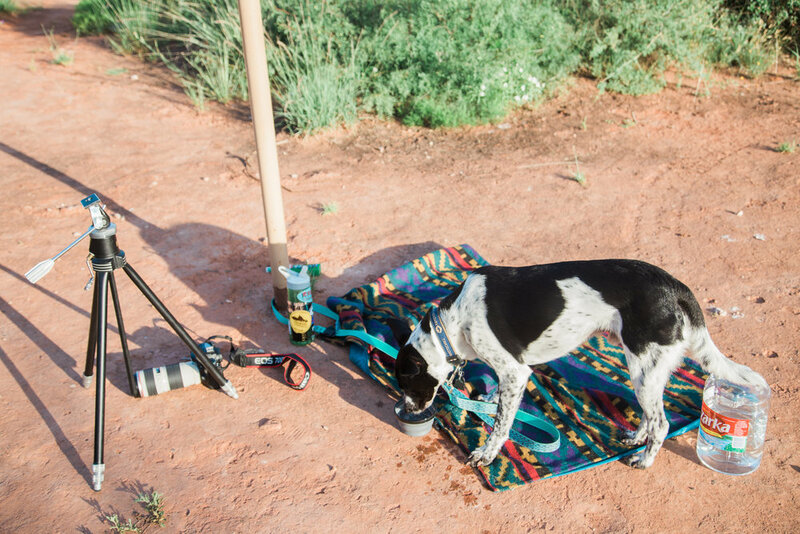 Much like when you're on the road or at a campsite, the most important thing to do when hiking with your dog is stay aware of his needs and be patient with him! If you're hiking somewhere with a water source, give him time to stop and drink often. When we did a 30 mile through-hike in Colorado, we crossed multiple creeks a day, so it was super easy to keep Charlie hydrated. Hiking around in Moab, Utah is a completely different story! We always bring his water bowl and plenty of water for him. As I mentioned above, be aware of wildlife in the area. If you're hiking somewhere with mountain lions or bears, try to keep your pup nearby and have a plan in case of an animal encounter. - Chaco leash. We absolutely love this leash because it can be easily clipped to anything, including your waist when you need both hands free! We actually have a make-shift version of this leash that Callen made out of climbing rope and carabiners because Charlie chewed through his Chaco leash on our last trip to Moab...he doesn't like being tied to trees. - Food bag. We use a drybag for his food because it keeps the smell contained and can be folded down so he can eat straight out of it. This plan only works if your dog will just eat what they need and then stop! - Water bowl. This thing is awesome! It folds up in to a tiny disk that fits in his hiking backpack and holds a good amount of water when unfolded. - Hiking backpack. We use his pack to carry his water bowl, some food, treats, etc. We've also used it for trash...don't tell him how shameful that is. - Dog bed. You GUYS. This thing. It's his MVP. I don't know why it took us until he was 7 years old to think of getting him a bed but it was the best purchase we've ever made for him!!! He sleeps in it at home, in the car, in the tent, and just chilling at the campsite. It's familiar to him and I think he feels at home anywhere he has his bed. While bringing Charlie along is more work, it is always worth it. We love having our little guy with us in the car (his favorite place to ride is in the lap of the front seat passenger), in the tent (he keeps our feet warm!) and on the trail. It's so fun bringing him to new places and watching him explore. Like I mentioned above, every dog is different and there is no perfect guide for bringing the dog along, but I hope this helped motivate you to include your buddy on your next trip! As always, feel free to comment or e-mail us directly if you have any other questions that we didn't cover!